B Clarke, S Madden, L Desmond, K Toner, I Birmingham, J Lennon, R McCabe, C Clifford (G Shaw 65), B Miele (D Clarke 65), C Forrester (J Doona 74), M Drennan. A Mannus, J O'Brien, R Lopes, L Grace, T Clarke, G Bolger, J Byrne (D Watts 79), A McEneff, R Finn (S Bone 90), D Carr (S Kavanagh 75), A Greene. Shamrock Rovers made an expression of intent regarding their title credentials in Inchicore with this win over St Pat's. An Aaron McEneff penalty early on was what decided the outcome, but Pat's fans will perhaps reflect that they have some way to go if they are to threaten at the top after being generally outplayed by the Camac. The Hoops' endeavour was epitomised by McEneff, who did a great deal of dirty work in midfield, while too many Saints players were unable to make an impact. They could have nicked a goal, for sure, but can have no complaints. This game should have been effectively over after just seven minutes but referee Neil Doyle only gave Kevin Toner a yellow card despite what looked a cynical if not despairing challenge in the box on Aaron Greene. The Hoops attacker had capitalised on a terrible mistake from Lee Desmond, who mis-controlled, but Doyle did not deem Toner's foul a professional one. The Rovers dugout, understandably, disagreed, but any frustration or sense of injustice was not evinced in McEneff's cool penalty. Pat's had just threatened beforehand, too, the impressive Rhys McCabe harrying the Rovers rear guard, winning back the ball and crossing for Mikey Drennan. Saints' top scorer did not connect as he wished but there was still an opportunity at the back stick for Brandon Miele, who fired over. Toner headed over from a corner on 13 minutes but Rovers were bossing possession and nearly went farther in front on the half-hour mark following an excellent move. Dan Carr's left-footed shot was poor after Jack Byrne unselfishly played him in, Greene centrally involved in the play. Despite having to be content with crumbs, Pat's still looked dangerous when they got the ball wide, with Rovers bereft of cover on their right-hand side. Drennan really should have scored but headed over after a cross from that area from the excellent Miele. Another sweet bit of passing presented McEneff with a major opening on 39 minutes. Carr played to Greene who back-rolled the ball to McEneff, only for the Derryman to produce a finish at odds with the quality of the set-up. McCabe produced a superb pass for Drennan as half-time approached but, somewhat off balance, he could not connect as he wished. The start of the second period was scrappy enough but 17 minutes in Rovers may wonder how they did not go 2-0 up, with Brendan Clarke batting away from Lopes in a goalmouth scramble, the away players pleading that the ball had gone over the line. Shortly afterwards, the ever-dangerous Trevor Clarke turned onto his right and crossed for Joey O'Brien, whose header prompted a fine Clarke save. 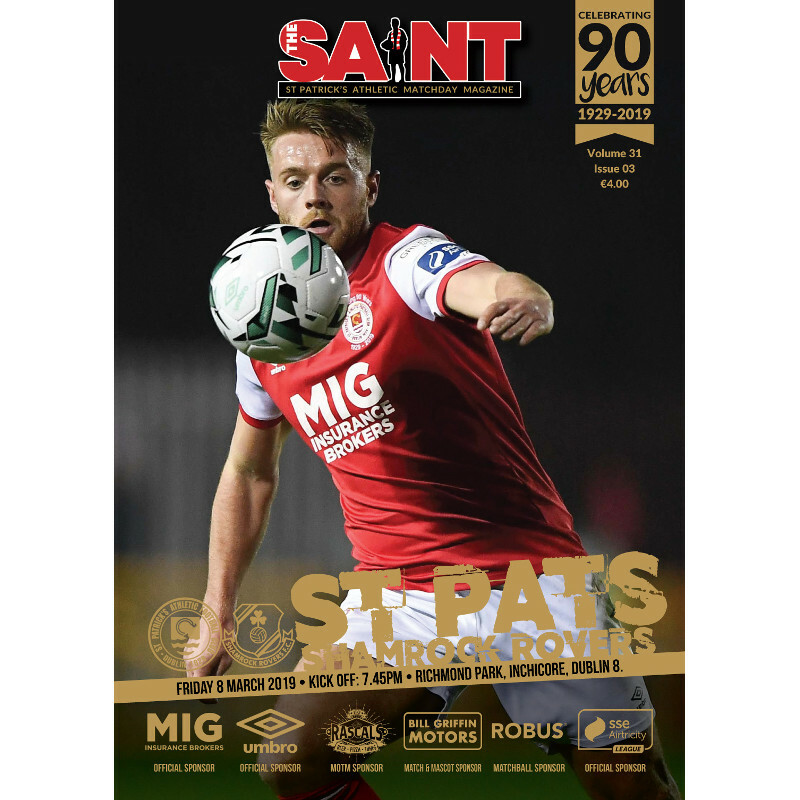 Saints almost smuggled an equaliser when an O'Brien slip allowed Drennan in but his clever outside-of-the-left pass just evaded substitute Dean Clarke, who had replaced Miele, who can consider himself unfortunate to be taken off. Greene will not want to see his miss with 13 minutes left again, his only excuse being that he connected with his weaker foot. After a comical mix up between Toner and Clarke, Greene hooked wide with an open goal gaping. Saints, for whom Chris Forrester again was totally out of sorts, had to survive another goalmouth melee before the final whistle, Rovers comfortable â€“ and very much looking title contenders. Indeed, Greene again should have netted at the death after breaking from a corner, Simon Madden gambling on winning the ball but Greene getting their first. Clarke, however, got down to save. Pat's never gave up but some of their fans now might regarding their title credentials.